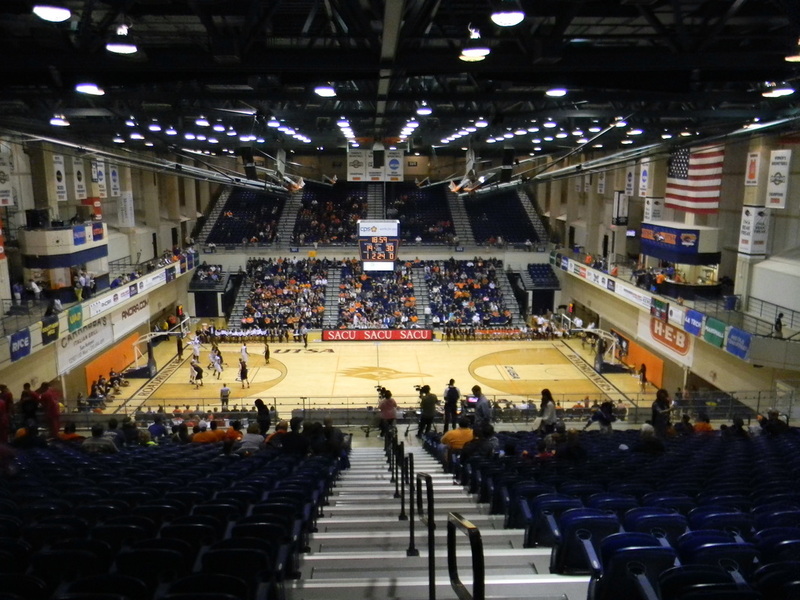 The UTSA Convocation Center opened in 1975. The Convocation Center is one of the oldest buildings on campus. The Convocation Center features two seating sections on the east and west sides of the arena. Both sides feature five sections of lower level seating and four upper level seating sections. The seating throughout the arena are blue chairback seats that include armrests and cup holders. The two rows at the top of both the east and west sides have bleacher seating with chair backs. The east side lower level seating, features the band in section 106 and the student section in section 107. On the north and south ends in the upper level of the arena they have walkways connecting the upper deck seating. This area provides spots for fans to stand and watch the game. You can find a concession stand located on the south and north end. Above the concession stand hangs a large American flag. The concourse at the entry features a concession stand, memorabilia from the women's team and memorabilia from the men's team. Here you will also find the women’s and men’s restroom. Next to the restrooms they have hallways leading to the opposite side of the Convocation Center. Through the halls you will see the locker room. On the women's locker room side you will see tributes to the teams and players the Roadrunners have had through the years. The exterior of the building features a rust look with windows at the top. The surrounding area of the building features several trees and walkways. They have a scoreboard hanging from the ceiling with the basics. You can find two scoreboards in the south and north areas of the arena. What to do on Game Days? #1 Head downtown to check out the Riverwalk! #2 After the Riverwalk check out the Mercado in downtown San Antonio. #3 You can park in these lots for free on campus. #4 Take a walk around the campus. #5 Head to the UTSA Convocation Center. UTSA Convocation Center: One thing I enjoyed about the Convocation Center is the walkways above the basket. This gives fans a unique vantage point they typically won't see in other venues. The seats were nice. The color scheme throughout the arena flowed well. I see UTSA having to make big decisions in the future in regards to basketball. The Convocation Center isn't going to cut it. Even if you add in new scoreboards and videoboards the Convocation Center still won't be in the top half of CUSA. The seating for an arena of its size puts fans too far away from the action. Maybe, I'm being harsh, but it's the truth. I know they have mentioned in the master plan a 10,000 seat arena, but take a wait and see approach on that, since it's the final phase of the athletic master plan. 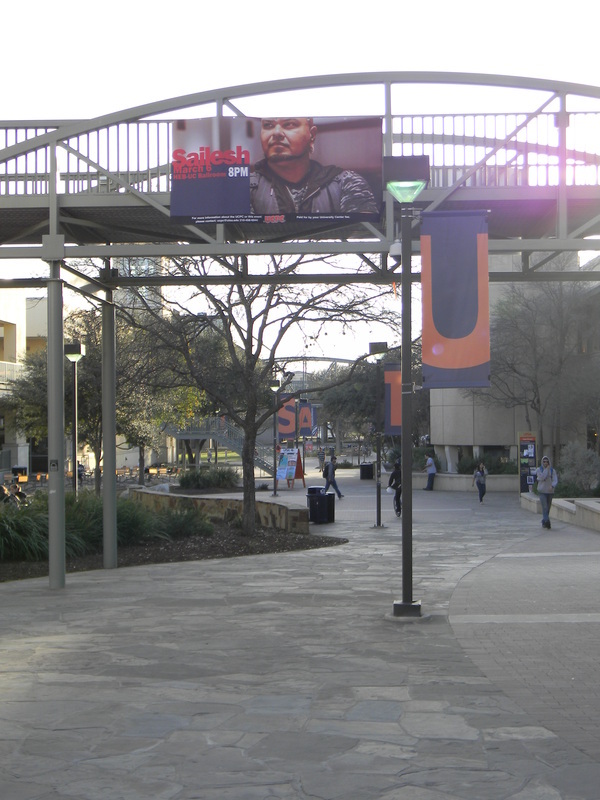 UTSA Campus: UTSA has over 31,000 students and the campus sits on 725 acres. Walking around campus you will see several statues paying homage to Mexican heritage. Check out the Sombrilla Plaza. The plaza is surrounded by the John Peace Library, MS Building, McKinney Humanities Building and Business Building. The Paseo area is nice with a park like setting. The campus is constantly evolving and the Park West development will be one to keep an eye on. Atmosphere: A few students sitting behind me at the game were very into the game. The band was pretty good. The game I attended had the largest crowd of the season. 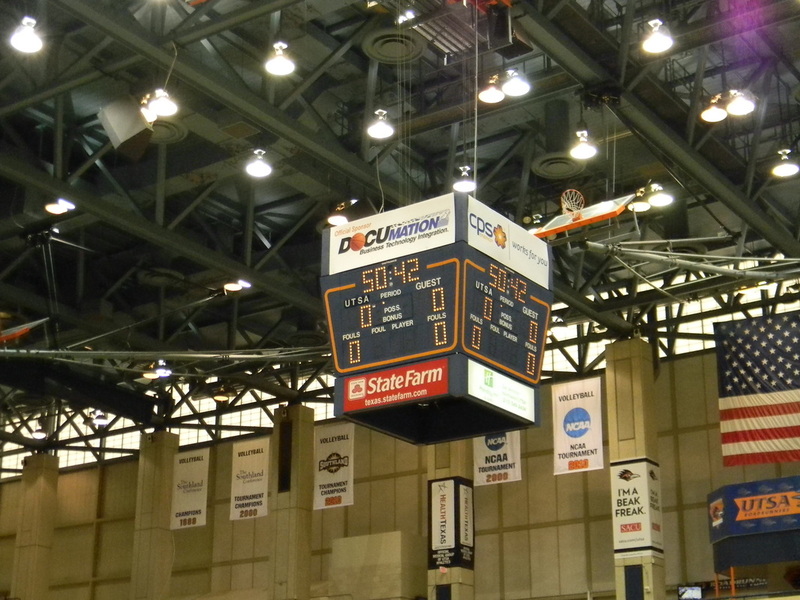 Scoreboard: This is one area that the Convocation Center could use a major upgrade. Not having videoboards really hurts, but not even having a scoreboard for player points, is beyond unacceptable in this day and age. It really affects the fan experience. I look forward to seeing what UTSA plans to do in the future regarding the scoreboards. San Antonio, Texas: (I used my AT&T center review, San Antonio write up) This is a great city to have a weekend getaway in. There are plenty of things to do in San Antonio from Sea World to the Alamo. If you're looking for an adventure Sea World, Six Flags or Schlitterbahn will keep you entertained. With only three Sea World's left in the US, this is the perfect time to visit. Take a ride on the Great White or check out over 100 penguins at the Penguins Encounter. Six Flags Fiesta Texas is located about 20 minutes from Downtown. The park has seven roller coasters with an eighth coming in summer 2013. Schlitterbahn is about 40 minutes away from downtown and is consider one of the best water parks in the world by MSN Travel! The Riverwalk is the biggest tourist attraction in Texas and I found out why. The Riverwalk's sidewalks navigate the city below street level and along the San Antonio River. One of the best ways to see the city of San Antonio and the Riverwalk is by taking a Rio San Antonio boat ride on the river. The river boat ride provides great facts about the city and river and is a relaxing way to see the city. If you get hungry you can choose from over 25 restaurants on the Riverwalk. From national favorites like the Hard Rock Cafe and Rain Forest Cafe to Riverwalk favorites Las Canarias and La Magaritas. If you're looking to get some shopping done on your trip, Rivercenter Mall should do the trick. The Riverwalk has plenty of lodging options, for visitors looking to stay right in the action. Downtown San Antonio has plenty to offer outside of the Riverwalk. The city takes a lot of pride in the Alamo. The Alamo is a symbol of Liberty for Americans and you can walk the same paths of the brave defenders of the Alamo. After a visit to the Alamo head over to HemisFair Park, the park served as the main ground for the World's Fair of 1968. The iconic structure that came with the World's Fair is the Towers of the Americas. The Towers of the Americas is actually taller than the more famous Seattle Space Needle by 87 feet. The Tower includes a restaurant and an observation deck for great views of San Antonio. Near the HemisFair Park is the Alamo Dome, the old home of the San Antonio Spurs. If you’re interested in seeing an area filled with Mexican culture visit San Antonio's Market Square. El Mercado is located here and is the largest Mexican market outside of Mexico. Great Mexican dining can be found at La Margarita and Mi Tierra Cafe and Bakery. With the squares vibrant colors and live music this is a place you have to visit. 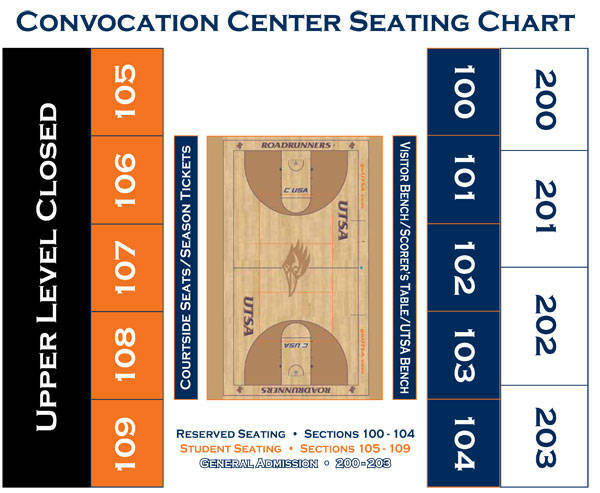 What's Your Rating For The UTSA Convocation Center? 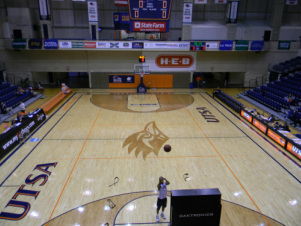 See Where The UTSA Convocation Center Ranks!